“I am every Alabama student!” says our fresh-faced spokesperson — with an awesomely unique personality — who’s agreed to help us explain why public education matters. 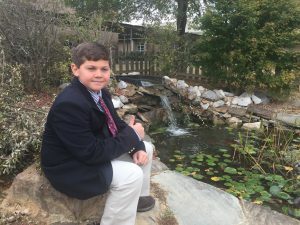 “Ace Reader,” (not his real name), is sharing the Alabama student voice with all those who will listen to encourage them to support their local schools, teachers and students for the sake of Alabama’s future. Played by Reid Brandau, a 7th-grade student in Elmore County, “Ace” works hard to bring public focus to how Alabama schools are working to improve teaching and learning, elevate expectations, and innovate through the creative use of technology and hands-on learning opportunities. Everything we do through our work at A+ is with the students in mind. We stay on top of the latest, results-driven research, help shape the best education policy to support what works for all students, and provide the training and support needed to participating Alabama educators and leaders to apply best practices at all levels. Ace symbolizes the future of Alabama, and how our support for his learning now will impact his future … and our collective future as a state. Follow Ace on Twitter @Ace4Ala, share his videos with your friends and colleagues, and encourage everyone to visit aplusala.org and find ways to support him — and all Alabama students — through our work. Visit the Video Gallery for all “Ace Reader says …” videos. Special thanks to Reid, and his parents, Matt and Vanessa Brandau, for volunteering their time, talent, (and many props) to help us create the “Ace Reader says …” series. Also, we appreciate the help of the Alabama State Department of Education in lending us their videographer and editing suite. Finally, a huge “thank you” to all the teachers and administrators in Elmore and Autauga Counties, the Camp Grandview YMCA, the Alabama Best Practices Center and A+ College Ready, for their cooperation in the making of these videos. 0 Comments on "“Who Am I, You Ask?”"